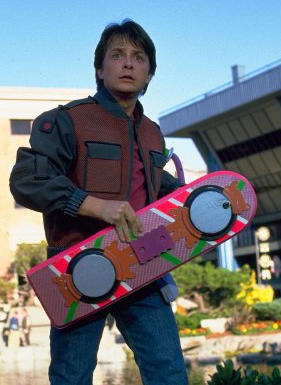 Hoverboards are Finally Here... Hmmmm? A new video going around by HUVr Tech is trying to convince us that they've finally invented the hoverboard exactly like those that appear in the Back to the Future movies. A bunch of stars are featured including original Doc Emmertt Brown, Christopher Lloyd, professional skateboarder, Tony Hawk (of course) and international musician, Moby. The video claims that the demonstration is 100 percent real but I gotta say the hokey physics displayed by people actually riding these HUVr boards is just as dodgy as the original movies. Not to mention the whole demonstration feels completely staged with not a genuine emotion about how awesome the invention of real hoverboards would actually be. There's speculation that the video and companion website may be a promotion for a fourth movie in the BTTF series but my money is on a Virtual Reality computer game of some sort. Why do I think that? First because the website talks about an upcoming phone app that tracks your location whilst riding your HUVr board (supposedly connected to your board via bluetooth). Second 'HUVr' is an acronym for something with the deliberate lowercase 'r'. It's not just a cool text-speak way to write 'hover'. At a guess I'm going with 'Heads Up Virtual Reality'. Whatever the site is really a promotion for, I guess we'll find out in December of 2014, the destination time shown on a counter at the top of HUVr Tech's website. Of course they may have actually developed an anti-gravity skateboard but you can bet your life, if they had, you wouldn't need a bunch of stars to try and give it credibility. That sh*t sells its self! For another article talking about who may be behind this read Heavy's post; HUVr Tech ‘Real Hoverboard’ Is a Hoax: 10 Fast Facts You Need to Know by Tucker Cummings. Unsurprisingly it turns out the HUVr tech video was entirely a prank by website Funny or Die who were busted by Mashable when a costume designer added their work on the shoot to their online resume (I'm thinking that person probably won't be working on anything that requires secrecy anytime soon). Both Christopher Lloyd and Tony Hawk have made apology videos. Tony's is embeded below. Whilst I knew it wasn't real I am disappointed it's not a promotional video for any upcoming Back to the Future tie in of any sort.